In a large bowl, make a vinaigrette by combining oil, vinegar and syrup. Trim ends of Brussels sprouts. Using a a very sharp knife, shave sprouts as thinly as possible to one 16th of an inch. Remove large core pieces. You should have about 4 cups. Toss shaved sprouts with vinaigrette and season with kosher salt and freshly ground pepper. (Keep in mind the cheese will add additional sodium when it is added.) This may be made up to 3 hours in advance, refrigerated. When ready to serve, toss with almonds and shaved cheese. 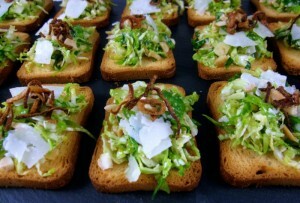 Spoon over crostini, if using as an appetizer, and garnish with reserved fried shallots. Or divide onto small plates if using as a salad.